The slab bridge across Greenleaf creek on what is now called Burnt Cabin road I think this is so pretty here. 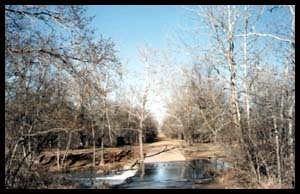 This old road used to be called Qualls road. Slab bridge across Greenleaf creek Here at this bridge, the road goes across on Burnt Cabin road and just after you get across the bridge going south, there is a little old road goes off to the right and south. It will take you to the old place where John Spencer used to live. It was called the old Whittles place. 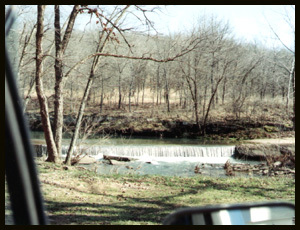 Then on across a small creek and up the hill is where Charlie Spencer place was. I took this picture from the south, going north. 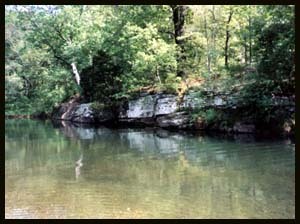 You can see off to the left across the creek is the Cedar Bluff road turnoff to the west.